You seemed nice but my mind is changing. This is not the only issue. You also have a nice speaker system that you blare all night long. Sometimes you leave the dvd running so that the sound plays over and over again. Just so you are aware, we share a wall and while I’m sure it’s great for space, placing all of your noise-making belongings on this wall is a pain for us. I know you use your cell phone as your alarm clock, you like staying up late on the phone and I also know your bedroom is on the complete opposite side of the apartment and you never seem to use it. I know where it’s located because we had a gathering with the previous tenants in that apartment. I miss the old tenants. I posted a sign asking them to please stop smoking inside because it’s leaking into other apartments. We’ll see how that goes. If this sign doesn’t help, we’ll pass along the info to our landlords. (We think they’re fun, interesting and helpful-probably not afraid to tell her to stop.) I bet they can smell it when they stop by the building. I know it sounds passive aggressive but we have a history of sounding like whiners to landlords and other tenants, at least I think so. We were on our neighbor’s bad side in our last complex. I don’t think putting your cigarette out on someone else’s car is cool and throwing trash onto our patio area also not going to fly. I’m not saying I give a rip if people think we’re tattletales, you do something that harms something of mine or someone innocent and I’m going to put a stop to it. We’re good tenants and have been putting up with this smoke issue for almost 2 weeks: first in the hall, not noticing it until we walked out the door and now, it’s all over our apartment. Yesterday was aggravating in general. I think I came across four people doing annoying things but I’ll only expand upon one more. We simply want to switch our vehicles for the winter, from the car to the truck in terms of insurance-park one, drive the other. For some reason, talking to our agent (we’ve had problems with her before) was like talking to a cactus. It seemed to be brain surgery and it worries me that I had to explain certain types of car insurance to her-I hope we are covered. According to the last paperwork we received, we were but I could be wrong since left to Smarty Two Shoes. After getting this situated, she had the gull to ask about life insurance for us………we’re covered, thanks. I wouldn’t go with her for anything beyond renter and car insurance, I might end up wearing a peanut sack in a cardboard box begging people for a nice bit of cheese and Greg would live in a tree, eating bark. He could actually eat this next recipe because it’s easy and one of his favorite breakfasts-rosemary baked eggs with Parmesan or manchego. Serve this with some toast and jam (we had amazing rhubarb jam from a local woman). This comes from eating-sf.com although I leave out the garlic oil and switched the amounts slightly. Preheat the oven to 375. Pour half a tbsp of milk and half of the butter into 2 ramekins. 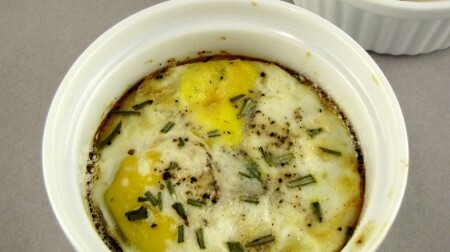 Crack 2 eggs into each ramekin without breaking the yolk. Sprinkle with salt/pepper and rosemary. Add parmesan or manchego over the top and bake for 20 to 25 minutes. Allow egg to set for a minute when you remove them from the oven and serve with fresh fruit, toast and jam and my favorite, coffee. This is wonderful for the weekend. next post: Great Scott Butter Chicken! I didn’t realize that Indianers were just as passive aggressive as Minnesotans! Oh yes, Hoosiers don’t like confrontation unless absolutely necessary…at least this one. I’ll climb up the tree with Greg and eat tree bark too if these baked eggs were my reward afterward! Mmmmmmm…so good! You deserve a smokeless environment, and your landlords deserve to be told someone is smoking in the building – it could affect <em)their insurance, other neighbors, and future renters. I hope you enjoy the eggs! I guess the sign worked because we haven’t had any smoke in the hall or leak into the apartment, it’s much better. (We are the only ones with insurance so say our landlords but that’s another story.) That and I think one of our landlords reads my blog, I’m sneaky!